Love it! Sugar free! Want more flavors in smaller containers. 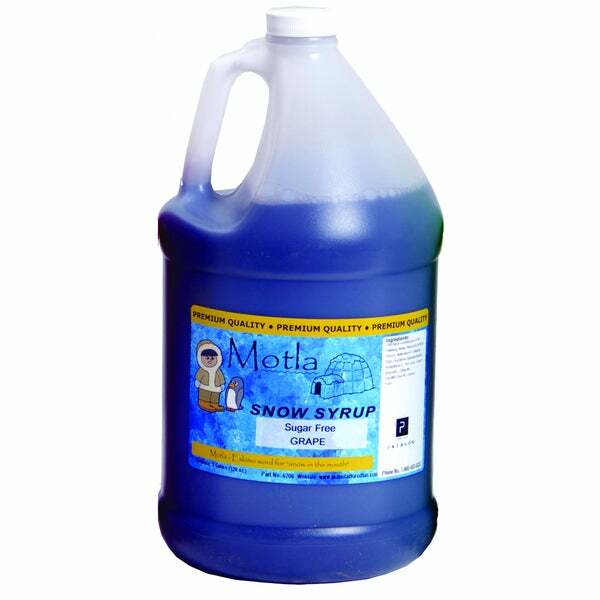 This syrup is a special splenda mix for an awesome low-calorie taste perfect for shaved ice. The syrup comes ready to use in a tasty grape flavor. Really strong flavor per ounce!!! Don't use near as much per cone. Your wife is your closest friend and companion, and Mother's Day is your chance to celebrate everything she does for your family. Here are a few easy gift ideas that are sure to be a hit with her this Mother's Day. Whether she's your wife, your daughter, your sister, or your friend, you can celebrate a mom's first Mother's Day with the perfect gift. If you're not sure what to get her this year, try one of these first Mother’s Day gift ideas. Top 10 Gifts for a 30th Birthday from Overstock.com. From understated tokens to festive gifts, here are the most popular 30th birthday gift ideas. Best Gifts for Her First Mother's Day from Overstock.com. Celebrate a new mom with these mother's day gift ideas. Best 16th Birthday Gifts for Girls from Overstock.com. Are you shopping for a soon-to-be 16-year-old girl? Here are our best sweet sixteen gift ideas. Whether it's their birthday, the holidays, Mother's Day, or Father's Day, shopping for your in-laws will be easier with these gift ideas. Make her Valentine's Day stand out with a special gift. Whether she's your crush or your wife, we have the perfect gift suggestions for your loved one. Top 5 Gift Ideas for a Bachelorette Party from Overstock.com. Our guides provide customers with bachelorette party gift ideas. Top 5 Mother's Day Gift Ideas for the Working Mom from Overstock.com. Your mom is a busy woman. Show her your appreciation with these Mother's Day gifts for working moms. Top 5 Parents' Wedding Gift Ideas from Overstock.com. Our guides provide customers with the top 5 parents' wedding gift ideas.